Sometimes it feels like you can't keep up with all of the occasions happening in your life. Maybe you even dread that awkward birthday moment where you'll read three of the same card and have to smile out of politeness. But then, you open up that one card that is exactly you. Inkwell Boutique is the solution for all of your moments of holiday writer's block, and somehow knows exactly what you want to say to your quirky mom on Mother's Day. They know the way to your dad's punny heart, and their card designs will make you wish you had never given up on art. Figuring out what is right for your health can be a challenge. Whether you're looking for teen counselling, naturopathic medicine, health coaching or even more specialized services, Bespoke Clinic fills in the gaps to help you understand what is really going on with your health. Their diverse team goes beyond treating your symptoms and focuses on educating, guiding and inspiring you to live your full health potential. By being in the pedestrian-friendly downtown neighbourhood, the clinic is accessible to those living or working in the area—they'll have you beginning your health journey just by going to your appointment. Experience Life SalonSpa, where the services are customized and focused on individuality. They dare you to be your authentic self and treat you like the unique individual that you are. Continue your experience at home with a vial of your own custom-blended aroma. You'll leave feeling beautified, purified and stress-free. Amos Pewter's handcrafted jewellery, ornaments and home decor designs are inspired by maritime nature and surroundings. These creations are sure to leave you pining for the ocean and wanting to take every bit of it home with you. Want to see the process of how they cast their products from molten pewter? You can just ask the artisans, they'll be happy to show you. Like the Amos Pewter locations in PEI, Peggys Cove and Mahone Bay, while you're visiting the harbourside downtown Halifax location, you can take part in a hands-on experience. This year, visitors can hand-finish a Canada 150 coin or the signature sand dollar, where with every purchase a portion of the proceeds goes to the Bluenose Costal Action Foundation. Walking into Ocean Optometry is like going to visit friends—well, more like your fashion-savvy friends who you desperately need style advice from. The owners and optometrists will look after your eyes, and the professional opticians are there to tell you which frame suits your face, or which colour doesn't complement your hair. The Ocean team gets to know you first, and helps pick a pair of glasses to fit your personality later. Take a look around at the four drawings hung on the walls of The Flower Shop and you'll see a little bit of history. The flowers have gone in and out of season, and the buildings have changed, but this shop has been a part of downtown Halifax for 80 years. The greenery around the new location shows off the shop's organic style, complemented by high ceilings and newly exposed brick walls. Grab a friend and try out one of The Flower Shop's macrame workshops, or just pop by to take in the sweet smell of fresh, local, in-season peonies and delphiniums that come right from The Humble Burdock Farm. Dip your brush into cadmium yellow, alizarin crimson or cerulean blue, and paint. 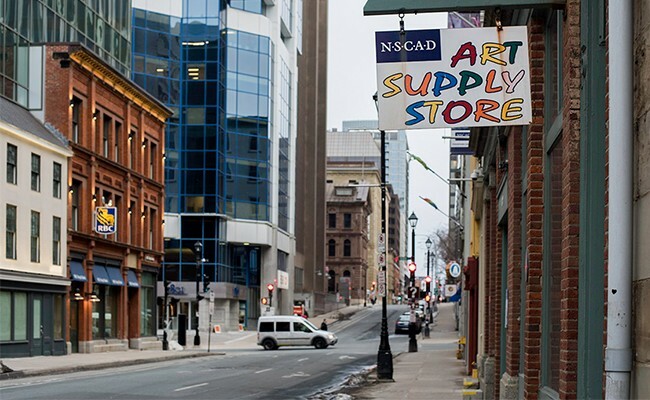 Whatever colour you need, whether oil, acrylic or watercolour, the NSCAD Art Supply Store has it in stock. All you need to supply is inspiration. Shop for yourself or the artist in your life. You don't have to be a NSCAD student or grad to browse and dream. The aisles are filled with new materials for you to test out during your next artistic spree. This family owned business has been serving your home-cooked meals since 1983, and you wish you could take the credit. The only complaint your guests will have about Rudy's Catering is that they wish they could eat more. Rudy's makes planning your next event, party or wedding stress-free, and they aren't afraid of a large guest list. They'll have your food ready on time, made fresh, and serve you like you're family. You'll get your first taste of Rudy's at an event, but you'll be stopping by their downtown location every day for lunch to satisfy your craving. The days of tasting savoury steak frites have been extended, and you'll never again have to go without in the winter months. This fabulous food truck has parked itself for good right in Scotia Square mall. Tin Pan Alley frites shop is a real mom 'n' pop shop, where owners Karl and Jill Warmé are serving Dutch-style fries inspired by visits to Karl's mother in Holland. The two spent their first years serving from the Tin Pan Alley food truck, where they could satisfy our foodie cravings on the go, but only six months of the year. The world's first Haskap Berry Powder is making itself known, and moving on into the wellness world. You don't have to look far; Haskapa is bringing this super-berry right to you in Bishop's Landing. One hundred percent pure, you get to hold onto 94 percent of the nutritional value and outstandingly high antioxidant content. It can be used in smoothies to crank up your daily nutritional intake, sprinkled over ice cream while indulging on a hot summer's day or as a way to add flavour and visual appeal to your morning oatmeal. There's no better way to describe Elle's Bistro except with the phrase "Treat yourself." Two years ago they filled a void in the downtown neighbourhood, and they are continuing to fill our hearts through our stomachs. Elle's does milkshakes the proper old-school style, right down to getting you that extra bit of shake from the metal can. Don't be surprised if you find yourself making a few trips to the bistro to pick between the S'mores, Rolo, Creamsicle or 20 other milkshake flavours. And let's not even get started on Elle's baklava cheesecake, drizzled with honey, or blueberry stuffed French toast. Is your stomach grumbling yet?